“I would highly recommend Dave Penney and DPC Consulting Engineers because of his integrity and ability to get the project done even under the most challenging circumstances." Restaurants, cafes, and coffee bars can be exciting and profitable additions to a mixed-use project, but they can also be a burden. Careful planning is essential. 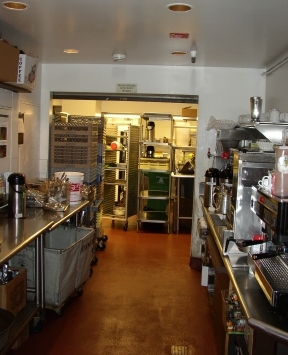 • Noise and odor are the main burdens a restaurant puts on a residential project. Careful planning of equipment locations, and strict enforcement of noise and weight limits of tenant equipment are recommended. • A major impact on the building is the kitchen hood and makeup air ducts. Duct shafts to the roof must be provided. Location and sizing of the shafts and the ducts inside them must be carefully planned. • An accessible way to the roof must be provided for piping, power & data wiring, and other utilities to be added or modified in the future. • Provisions must also be made for the HVAC systems that any tenant space would require. • Restaurants use large amounts of gas and water, so dedicated utility meters are worth considering. • An often overlooked item is where the restaurant’s water heater will go and how it will be vented. • If the space is on a post-tensioned slab, it is important to mark the tendon locations and other areas where the concrete cannot be cut, and to require the tenant’s contractor to X-ray all proposed slab openings before cutting. • We try to avoid installing grease traps ahead of time, since it is difficult to estimate how large they need to be or even if they will be needed. We recommend designating locations where future grease traps could be installed by the tenant, should they prove to be necessary. We have designed about a dozen mixed-use projects with accommodations for future restaurants. We have also designed the HVAC and plumbing for restaurant kitchens, some in very challenging locations, so we know the issues involved from both sides. © 2010 DPC Consulting Engineers, Inc.